Just like previous generations, today’s pork producers are always looking for ways to improve how they raise pigs. While that includes seeking advice from veterinarians and nutritionists, it’s also critical for producers to be able to compare apples to apples when it comes to something as important as choosing the right alternatives to antibiotics. With the recent prohibition of all medically important antibiotics for growth promotion, the Pork Checkoff’s Animal Science Committee knew it was the right time to fund research to help producers decide what’s best for the health and growth of their pigs, according to Chris Hostetler, the Checkoff’s director of animal science. The committee funded research to establish a standardized testing protocol for alternatives to antibiotics used for growth promotion. The study, proposed by Nick Gabler, assistant professor of swine nutrition and physiology at Iowa State University, will develop a protocol to define the critical components of methodology and experimental design to determine product efficacy. To date, Gabler and his team have reviewed nursery-finisher studies, including the methodology, experimental design and types of data reported. 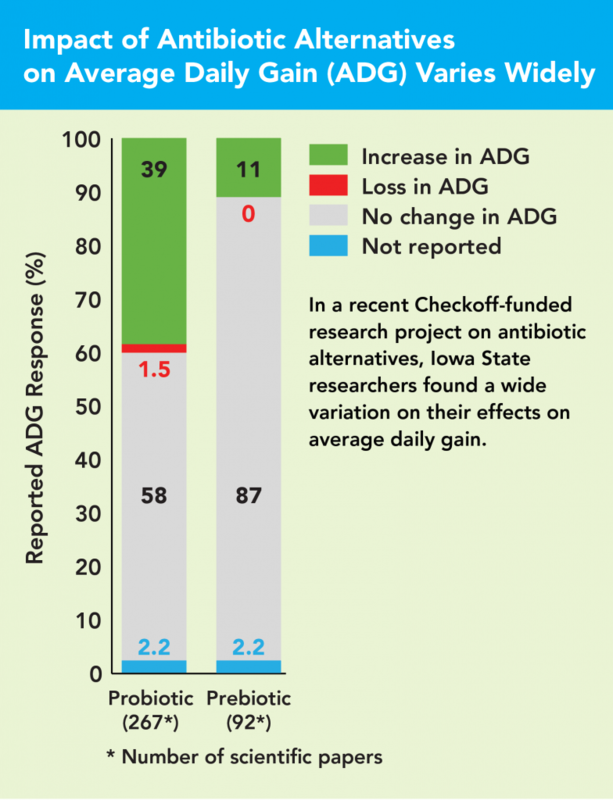 They uncovered 2,296 articles related to antibiotic alternatives for pigs. The team filtered the results to remove duplicate articles and those published before 1990. This yielded 1,698 scientific articles to aid them in determining the necessary elements of methodology and experimental design. While the direct, on-farm comparison tool is still a few months from being completed, the Iowa State researchers have identified specific classifications of compounds most efficacious in terms of on-farm production benefits. For example, when researchers reviewed 267 studies on probiotics, they found a reported improvement on average daily gain 39 percent of the time. However, when researchers did the same with the 92 studies on prebiotics, they found a reported improvement in average daily gain only 11 percent of the time, as shown on page 40. The full report will be available later this year. To view the database now, go to pork.org/blog/alternatives-growth-promoting-antibiotics/. Will 2017’s Key Trends Continue?